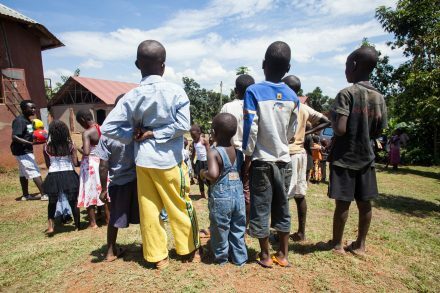 What happens to children in Uganda when their parents or caregivers are imprisoned? Who are they? How many are they? Where do they live? Are they still be able to attend school? Who cares for them in the absence of their parents? Does the criminal justice system take their existence into account when sentencing their parents? What happens if the community stigmatizes them because of their parents’ crimes? These are some of the questions that PRI and FHRI sought to answer in August 2015 when they embarked on research on children of imprisoned parents and the extent to which the ACERWC General Comment 1 on this issue was being implemented in Uganda. When parents and other primary caregivers are arrested and sent to prison in Uganda (and many other parts of the world), very little is known or recorded about what becomes of their children especially those who do not accompany their mothers in prison. Even though the Ugandan NGO, Wells of Hope, estimates that 200,000 children in Uganda have a parent in prison at any one time, there are no precise figures about how many children are affected by parental imprisonment nor how it affects them. In July 2015 there were 45,314 people in prison in Uganda, 2,039 of whom were women, and much as we do not know how many of these prisoners had children, nor much about their lives, it is reasonable to assume that a very large proportion of these prisoners were parents or primary caregivers to at least one child and most likely four or five. Article 30 of the African Charter on the Rights and Welfare of the Child highlights directly how the rights of children are affected when their primary caregivers are caught up in the criminal justice system. In November 2013, the African Committee of Experts on the Rights and Welfare of the Child adopted General Comment No. 1, Children of Incarcerated and Imprisoned Parents and Primary Caregivers. This General Comment defines States Parties’ obligations to respect, protect and fulfill the rights of this overlooked group of children. Including reviewing sentencing procedure so that a non-custodial sentence is always considered when parents/ primary caregivers are being sentenced, ensuring appropriate alternative care for these children, setting up special institutions for children accompanying their mothers in prisons and regular contact with affected children and their parents in prison. The children involved in the research had experienced stigma and discrimination from their communities because their parents had committed crimes and were in prison. The findings from the research in Uganda also showed that the child protection system in Uganda is extensive on paper but under-resourced and provision of alternative care for this group of children is patchy; pre-trial detention is still over-used meaning that children are left without parental care unnecessarily; the Sentencing Guidelines adopted in 2013 are excellent but are not properly implemented so an offender’s care-giving status is not always taken into account at the point of sentencing. There is an urgent need to address the stigma and discrimination that these children face, and to establish a comprehensive child protection system to provide alternative care and protection. We hope that similar research will be conducted in other States Parties so that General Comment No.1 will become more widely known and implemented, so that this group of children will become visible on the agenda of law and policy-makers. The report A Shared Sentence: Children of Imprisoned Parents in Uganda was launched at the ACERWC ‘Conference to Assess the Situation of Children in Africa 25 years after the adoption of the African Charter of the Rights and Welfare of the Child (ACRWC)’, 20-21 November 2015 at the African Union in Ethiopia. The report was also launched and disseminated in Kampala, Uganda on 25 November. We hope that the recommendations from this research will inform Ugandan legislation, policy and practice to improve the situation for these innocent and vulnerable children. Diva Mukisa is Programme Officer at FHRI. She leads FHRI’s work with PRI on the UN Bangkok Rules on the treatment of women prisoners in Uganda and works on juvenile justice issues. She coordinated this research on behalf of FHRI.